Founded in Norman times, Devizes is a compact town and is easy to appreciate on foot. Some of Devizes’s 500 listed buildings survive from the 16th century though most were erected in Georgian times. The Market Square and its adjacent streets and alleys host many of the town’s coffee shops, restaurants, pubs, independent shops and an indoor market. Devizes was a major centre for the construction of the Kennet and Avon canal, and especially the spectacular Caen Hill flight of 29 locks; this was a major engineering feat when it was built at the end of the 18th century. An easy walk from the Wharf to the top of the flight provides excellent views of surrounding countryside. The tow path in both directions from Devizes is well used by walkers, cyclists and fishermen. Devizes Branch supports the Trust’s goals through volunteering and fundraising. 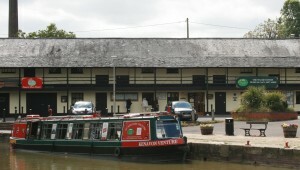 We are based around the Trust Headquarters building, an historic bonded warehouse on Devizes Wharf. On the upper floor, the Trust’s museum tells the tale of the construction, operation, closure and restoration of the canal. A tea room provides drinks, snacks and meals. We run the trip boat Kenavon Venture, a 45-seater passenger boat with a busy schedule of public trips, ‘specials’, and private charters from Mother’s Day to Christmas. For details of the boat and the trips that are available, please click HERE. Skipper and crew for all trips are volunteers, with training provided to meet the safety requirements of the government’s MCA inspectors; new volunteers are always welcome. We run social and fundraising events through the year with all proceeds going straight to the Trust. During the winter we have a “We’ve survived Christmas” party, and an informal evening with a meal and a speaker. We also have an annual skittles match against the local branch of the Wilts and Berks Canal Trust. Throughout the year we try to have a stand at other local events to provide information about the canal, and to raise funds. In the past we have organised a major raffle in support of the Trust. We run Carnival on the Canal, an evening of music and food on Devizes Wharf during Carnival week. This has become an established feature in the late summer, with good crowds gathering. It provides an opportunity for Devizes residents to visit the canal, and for the branch to raise money. We help with the maintenance of the Canal Trust’s historic headquarters building, so are always on the lookout for people with trade or DIY skills to offer – though unskilled labour is also needed. Boat maintenance during the winter usually requires painting to be done, but other relevant skills are often needed. We encourage all members to help look after the canal, for example by collecting litter when walking on the tow path. Our volunteers keep the shop/information centre on the wharf running. This is a vital front door for the Trust; but in quiet periods the HQ office next door will often welcome some help too. Our volunteers help with a range of educational activities, from entertaining children on boat trips to giving talks about the canal to other groups or organisations. We have an electronic newsletter (Members’ Newsletter December2017) that provides news about our activities, gives dates for future events, and gives information about volunteering opportunities. Recent editions are in our blog pages here. We are a friendly bunch, and welcome others to join us in supporting the Trust’s aims while having a lot of fun in doing so.